Westhoughton Market is open on Tuesdays, Wednesdays, Thursdays, Fridays and Saturdays offering a wide variety of stalls, with occasional events and 'special markets' taking place at regular intervals making use of the rear hall. For further information contact Westhoughton Market, pop in on one of the Market Days (or call Karen on 07463 856197). 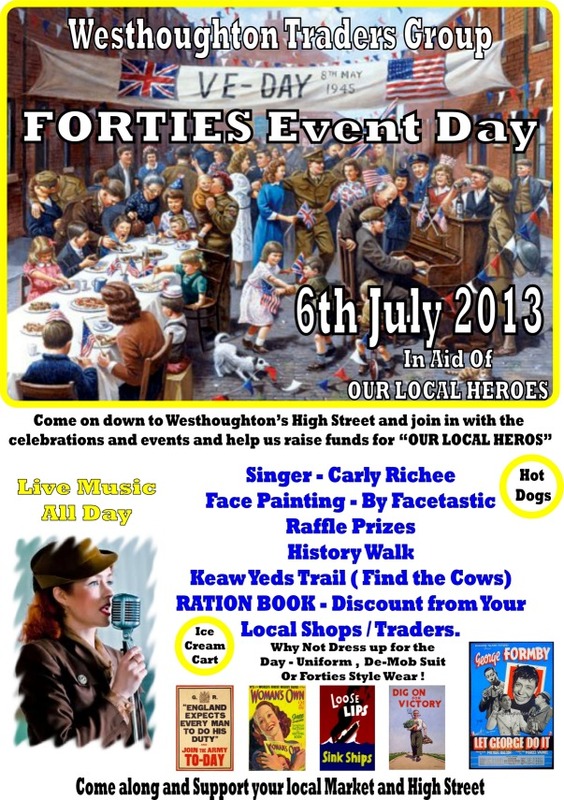 More info at Westhoughton Market can also be found on their Facebook page. Now under new management, Westhoughton Market has seen some changes with the rear hall being filled with a variety of stalls and offerings, open on all market days, with more stalls, there is a lot more on offer including: mobile phone upgrades and repairs, carpets and rugs store, luggage, second hand clothes, sewing services, beauty therapy, the return of Ken's Deli… plenty of bargains to be had. Watch out for the occasional special family-friendly events putting the market at the heart of the community, such as Easter and St. George's events and special markets in the run up to Christmas. On such 'community days' entertainment will be provided by presenters from Howfen Radio. Join the fun! Westhoughton Market is going for thrills and fright this weekend as it celebrates Halloween! Family-friendly activities and lots to see and do. Come see the popular Curious Critter 'Live Show'. There is free face-painting; take pictures in the spooky jail. Get the kids to bring along a pumpkin and enter it into the Pumpkin Carving Competition. if you've not been for a while it is a chance to see the changes and new stalls and wide variety of goods at the New Westhoughton Market. A great fun filled day, children oriented day at you local award-winning market… meet the animals from 'Little Barn Farm' - Penny and Dora, the wonderful pigs; Stroke Betty and Lola 'Little Barn's' friendly sheep, on hand a variety of farm animals to meet and greet. Easter Egg Hunt, face-painting, and music and commentary from the Howfen Radio team. 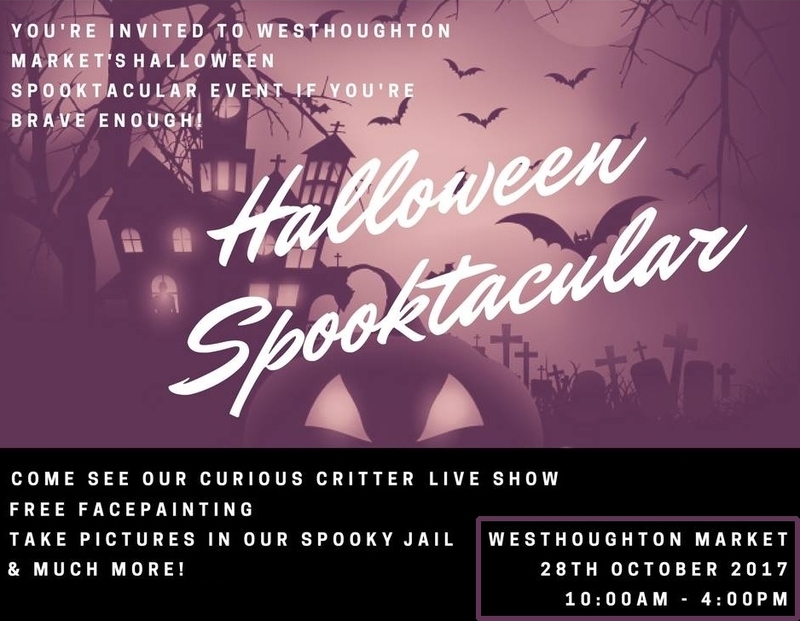 Bring the family for a fun day to celebrate Halloween at Westhoughton Market! Plenty to see and do: Halloween Scavenger Hunt; prize for Best Fancy Dress (All children who arrive in fancy dress will be given a treat); Pumpkin Carving Competition (bring along your Pumpkin and enter it into our competition); meet Spiderman and Iron Man; meet the Owls; free Spooky Face-painting; Tombola and Side Stalls; Tarot Readings, with music by the Howfen Radio team. A wildlife experience with a Curious Critters Day, and a chance to see up close beasts and bugs. Also reptiles; rescued, rehabilitated birds of prey from The Barn Owl Bill Charitable Trust. 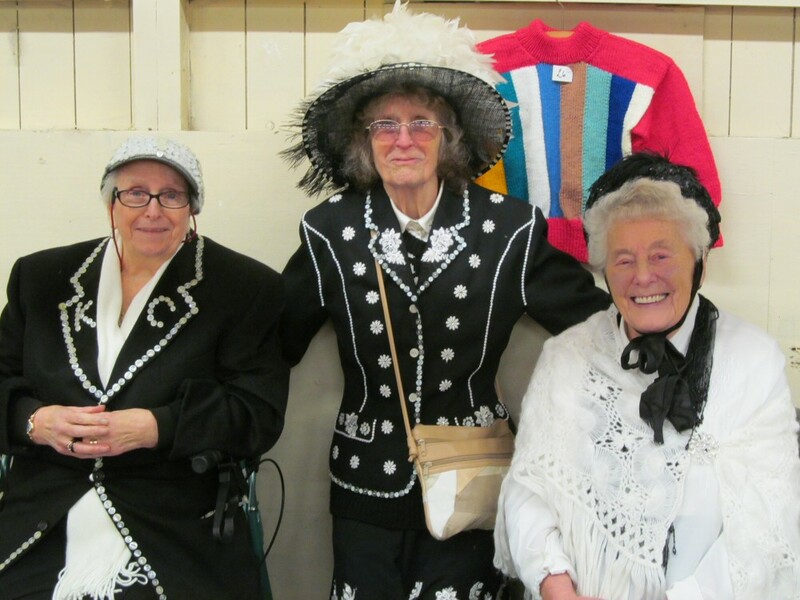 Westhoughton Market joined in the fun for this colourful, annual event. Traders donned 40s and 50s costume; with themed stalls and entertainment throughout the day. A good turnout for this Family Funday community event celebrating St. George's Day. A mix of entertainment, special attractions and, of course, a range of stalls to peruse. It is good to see the market so full and with such a wide range of offers. This year's festive market was a great success: as well as the normal stalls, there were themed visiting stalls and attractions such as model boats, reindeer, birds of prey, face-painting; entertainment and sing-a-longs from local acoustic players - the Travellin' Strings - and of course, a visit from Santa in his grotto. Good to see the market so busy on a cold and wet winter's day! Complimenting the Rainbow Crafts Victorian Fayre at the Carnegie Hall, in 2014 event Westhoughton Market and the Westhoughton Traders Association held another Christmas Fair on Saturday, 6th December with entertainment from The Travellin' Strings, as well as a selection of festive stalls in the rear hall. Getting into the Christmas spirit, traders donned their Victorian costume. 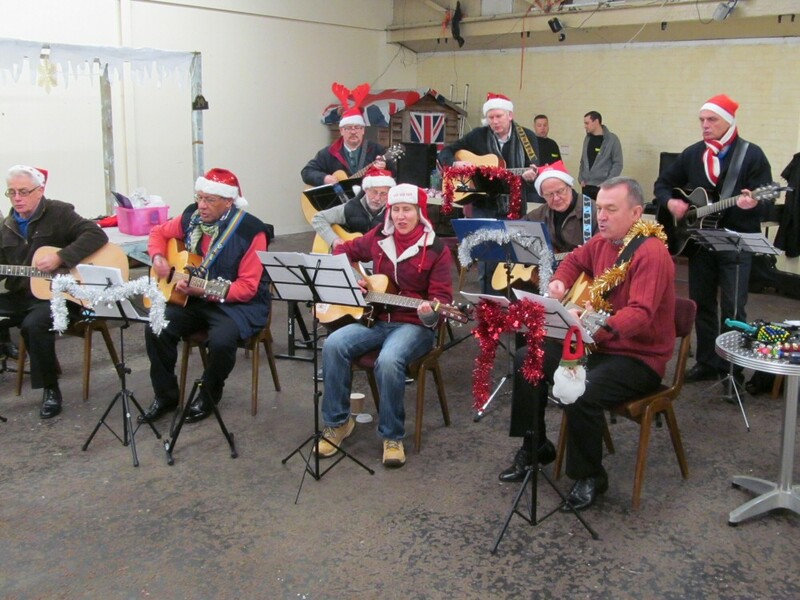 The Travellin' Strings performed a festive guitar sing-a-long in the morning, with covers band, Timeshift, performing in the afternoon. Santa was in his grotto , helped by his elves to meet and greet the good little boys and girls of Westhoughton. Tombola and raffles raised money for good causes: Alzheimer's Society and Our Local Heroes. A national campaign to encourage shoppers to visit their local market, traders at Westhoughton Market are organising a community event for the day with entertainment and things to do and see. There will be a bouncy castle for the children, a birds of prey display - get up close to these amazing creatures; and as well as the usual stalls there will be some extra stalls offering even more bargains. Why not pop along and see what's on offer - it may surprise you! "Love Your Local Market is a celebration of our market culture here in the UK that happens over a fortnight in May. 700 markets took part last year, putting on over 3,500 events. LYLM is also all about entrepreneurship and since we started in 2012 the markets industry has pledged around 7,000 pitches to new traders." 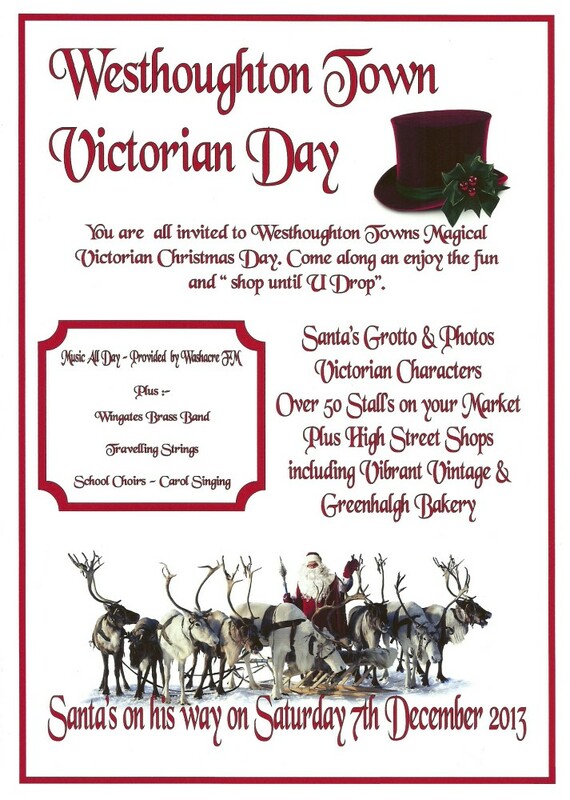 Building on previous successful events Westhoughton Market traders, in conjunction with Market Street shops and businesses, are planning for their 3rd annual Victorian Market. There will be a mix stalls, entertainment, community activities, and a fundraising raffle. Period dress. Santa's grotto will be back. In the latest of the regular themed events organised by Westhoughton Market and traders on Market Street, on Saturday 6th July Westhoughton was taken taken back in time to the war-time era of rationing, simple but stylish dress, the need to keep spirits up whilst fighting the foe and community togetherness. Organised over many months, there was plenty going on throughout the day in and around the market and Market Street itself: sights and sounds capturing the spirit of the 1940s. Click on arrow to view slideshow. Rations Books with information and discount vouchers were given out to entice local residents, promoting the Market and its many and varied stalls and shops and businesses on Market Street. The event was also in support of the Help For Heroes charity raising £861. On the day there was local singer Carly Ritchie performing classic and timeless songs; a local history walk of Westhoughton town centre organised by the industrious Local History group, themed stalls in the rear market hall, entertainment at Vibrant Vintage, raffles, Cow Trails, ending with a short remembrance service at the cenotaph to acknowledge the debt owed to our servicemen. Following on from the success Westhoughton Market traders had with their Victorian Market last year, it was decided to approach the other traders on Market Street to see if they would be interested in holding a Victorian Day involving the whole of the street. It is hoped that this will spotlight some of the many businesses and independent shops we have on our high street. Taking place on Saturday the 1st of December it coincides with the local produce market usually held on the first Saturday of the month. A small group of traders made up staff from Bloomin' Flowers, Wetherspoons, The Wheatsheaf, Toymaster and Greenhalgh's Bakers, and seven market traders have met every month to formalise the day. In all a total of twenty businesses on the High Street plus all the market traders have committed in one way or another to being involved in making this a magical day. Shopkeepers, stallholders and public house staff will all be dressing in Victorian dress giving the whole street a very festive air. Come along enjoy the smell of hot chestnuts roasting, enjoy a glass of mulled wine in Wetherspoons and enjoy all the fun of the fair. A day with something for everyone. Throughout November we are running a competition Where is the Victorian Lady to publicize the event. Every Tuesday, Thursday and Saturday a new picture of Victoria will be put in the Market, Wetherspoons, and the Wheatsheaf as well as appearing on Westhoughton Market's Facebook page. 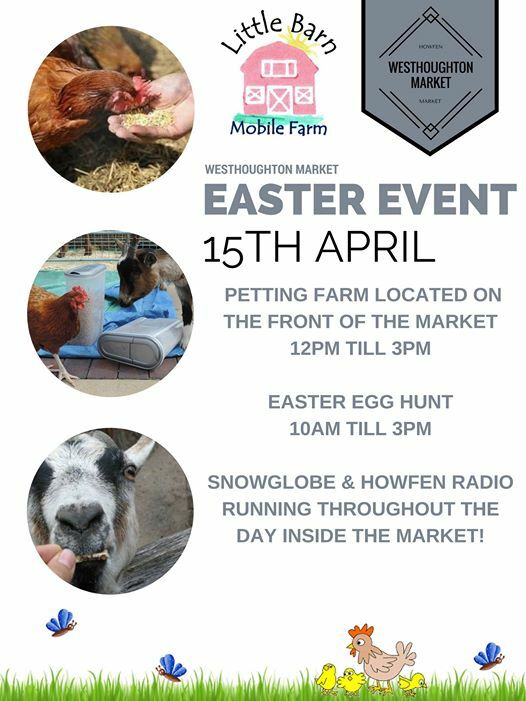 All you have to do is pop your entry in the box in the market or email it to Westhoughton Market with your name contact number and where you think she is and number of picture. This competition is being sponsored by Nick's Restaurant at Chequerbent. Prize is a £30 voucher for Nick's. There will be lots of fun on the day with a bake off competition. Where would be bakers can enter a Christmas yule log, or mince pie these must be baked and decorated by yourself. The winners will be judged by Nick from Nick's Restaurant, one of Greenhalgh's Master Bakers, and Councillor Ryan Battersby, Mayor of Westhoughton. It's 50p per entry, and forms available in the market and other participating venues. Not forgetting the junior bakers we have the Best Decorated Log for under 15s. This has been sponsored by the Pottery Studio. 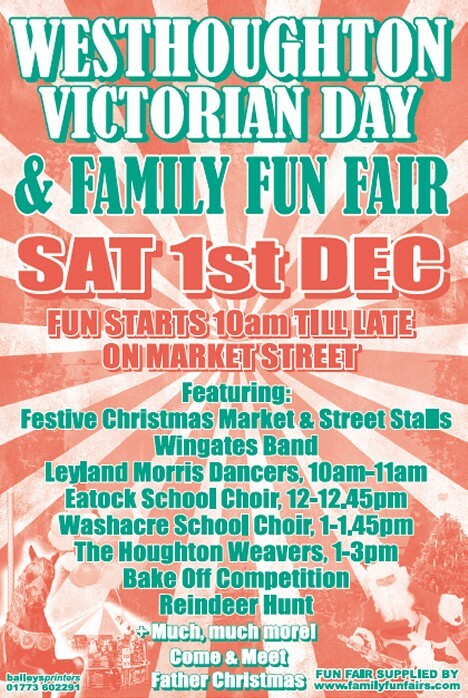 On the day there will be lots of fun, starting in the morning with Wingates Brass Band between 10am and 12 noon at the Market; Leyland Morris Dancers, 10am to 12 noon at the Town Hall; Eatock Primary choir singing carols between 12:00 and 12.45pm near the Status@BL5 boutique; Washacre School choir will sing between 1:00 and 1:45pm at the Town Hall. Finally, local legends, The Houghton Weavers will be performing between 1:00 and 3:00pm in the Market Hall. 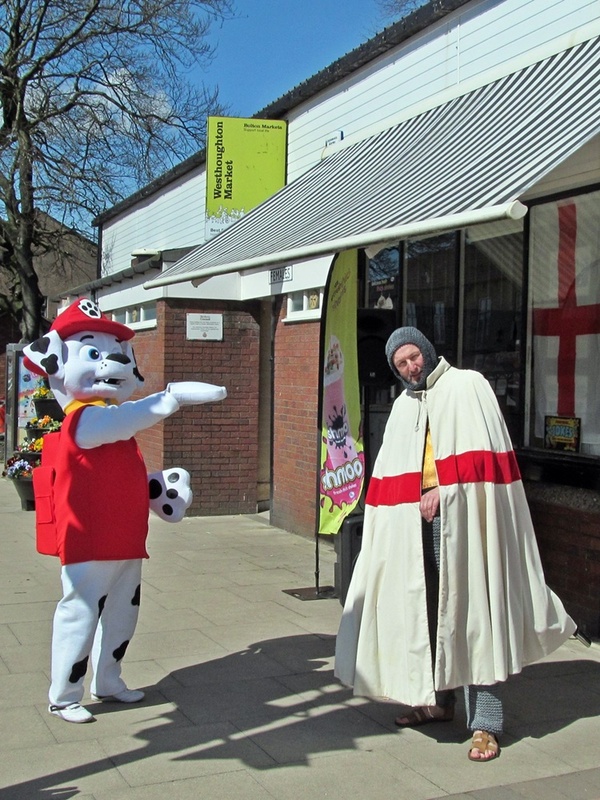 We will also have several cartoon characters out on the high street. Darth Vader will be in Toymaster between 10.00am and 12.00pm and Buzz Light Year will also step back in time to visit our event. There will be Chadwick's Fun Fair providing fun and thrills for all during the day and early evening behind the Wheatsheaf Pub with all the fun of the fair. Father Christmas will be in his grotto in the market from 10:00am until 4:00pm, with a small break for lunch. He is being helped by the Westhoughton Community Queens and Princesses. Shops are dressing their windows for the event and many shopkeepers and market traders will be in Victorian Dress. Many shops and businesses will be offering a variety of goods from hot mince pies, pies and peas, mulled wine and Christmas ales and roast chestnuts all to get us in the Christmas Spirit. Bloomin' flowers have a 'Guess the Number of Robins' competition running throughout December so get along and see if you can win their luxury hamper. There will also be a 'Reindeer Trial.' Families can obtain questionnaires from participating businesses for 50p, and see how many reindeers they can find using our cryptic clues. This will run throughout December so family's can have some festive fun, and we can raise money for the Mayor's charities. There will be many reindeers in shop windows but not all will be the ones you are looking for! High street shops are also entering the 'Best Dressed Window' competition which has been organised by the newly formed Westhoughton Traders Association. In the event of wet weather the children's choirs will sing in Wetherspoons and Cherry's coffee shop. The Morris Dancers will be in the Market Hall. It is hoped that if this is a success we can make this an annual event with more shops involved next year. All monies raised from the event will be given to Westhoughton Mayor's charities - Ovarian Cancer and Kids of Bolton. So come along and enjoy some old-fashioned fun and see what your town has to offer. The fun will start on the 30th November when the Westhoughton's town lights will be switched on by the Mayor. 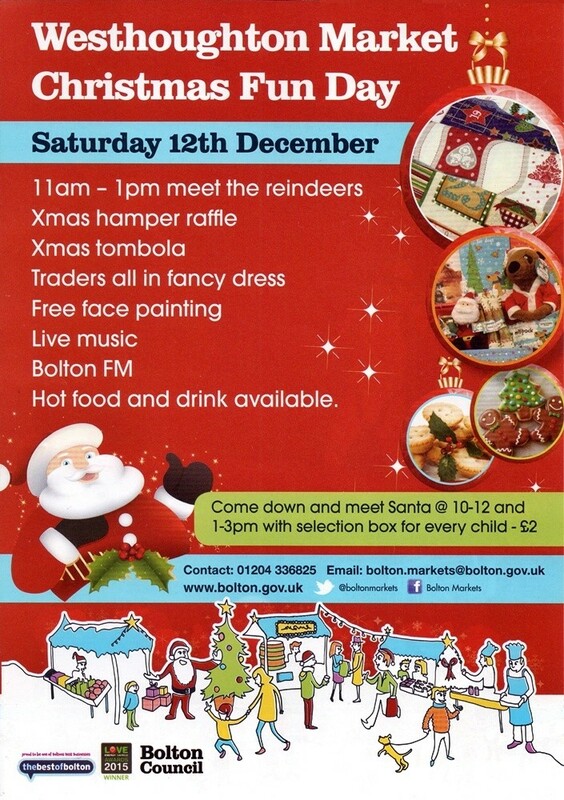 Traders will be in Victorian Dress and the children from St Bart's will be singing carols.